Hackers are continuing working on SIRI and they are discovering something new in it everyday. As for now, we meet with Lingual - a new jailbreak-only tweak, from Code Themed team, that allows translation from English to 30+ languages. The developers hope to include translation to English in a future update. We have not installed the tweak, but some people have reported that they have tested it and it works flawlessly, quickly pulling in results using Microsoft’s Bring Translate API as a backend. Its only limitation is that backend is not strong enough and sometimes fails to correctly translate phrases. But it is said that developers of Lingual cannot be held accountable for Bing’s shortcomings and they have done an important work in such a short period of time. This could prove a useful tool at your disposal. 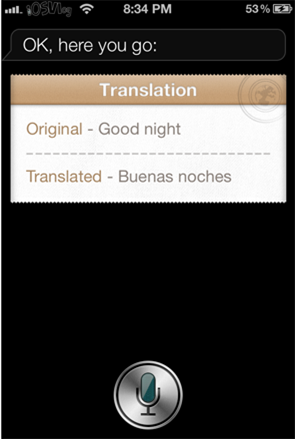 To use the tweak say to SIRI: “translate [something] to [language]” or “what is [something] in [language]?” No icon will be added to your home screen and no settings are available for the tweak. Just install and talk to SIRI.